Bezos’s book purge came in the midst of the extraordinary political spectacle engineered by an awakened Congressional wonder woman named Ilhan Omar. Her exposé of the Zionist-Judaic underbelly of the American political system happened in the most unflattering way. Rep. Omar asked, “Why is it ok for me to talk about the influence of the NRA, of fossil fuel industries, or Big Pharma, and not talk about a powerful lobby that is influencing policy?” She was referring to AIPAC, of course, the most powerful foreign lobbying group, which, while protesting that it was powerless, promptly brought ALL the business of the United States of America to a screeching halt to demand an instantaneous group hug from the 535 Congressional members on its payroll! Rep. Omar’s adroit maneuver exposed the fact that 12 of the top 20 political donors to the American election system are Jewish Zionists, their money amounting to a whopping 78% of the total contributed. What began as a campaign to officially repudiate, isolate, and control this freshman Muslim phenom, dramatically backfired. In effect, she forced the nearly all-white boys’ club to go on record to condemn “discrimination and bigotry against minorities as hateful expressions of intolerance that are contrary to the values and aspirations of the United States.” Symbolic, for sure—but Dr. King couldn’t do it; Pres. Obama couldn’t do it. 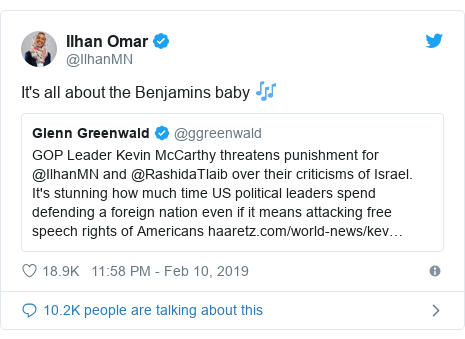 It took but a few weeks and a tweet for Ilhan Omar. She even signed the resolution. For the first time, the annual March meeting of the AIPAC caliphate will have far more attention than it wants, and Omar’s political star rises ever higher.